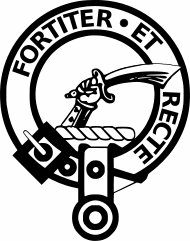 The Elliot Clan is one of Scotland's oldest Border Clans, and are reputed to have been one of the most, if not thee most troublesome of the Scottish border Clans. The spelling of the name Elliot would you believe, has seventy seven different variations, some of the more common spellings are Elliott, Ellot, Eliot, Eloth, Ellwood, Elwald, Ellet, Elewald Elwold and Hellwood. They are a prime example of a border family, that may have many origins. 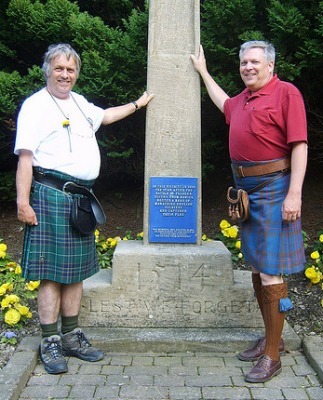 The clan has existed with a recognized Clan Chief, since King Robert the Bruce's time (1306-1329) and are one of the major Scottish Clans in the world today. The name Elliot it is believed, derives from the Scottish village of Eliot, in Angus. The Clan has two versions of the Elliot tartan, although similar, they do vary slightly. The modern and ancient tartans vary in the intensity of the colours, with the modern tartan being somewhat brighter, due to the use of chemical dyes. The two tartans are somewhat unique in as much as they are predominantly blue. in colour. The Gentleman on the right in the next photo is wearing the Elliot tartan. Unfortunately not much is known about the Clan's early history, as very few records survive, in all likelihood because most were lost when the Elliot's Castle Stobs was burned down in 1712. The Elliot clan were border reivers, that is, they made raids across the Scottish/English border, attacking farms, towns and even fortresses, plundering anything and everything they found valuable. 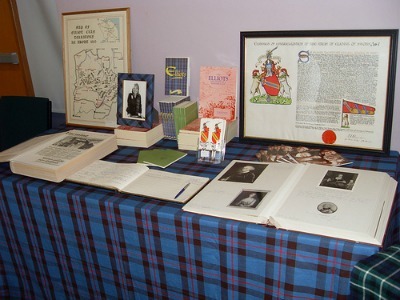 Below you can see a photo of the Clan Elliot display table at the Border Clans Day. The border region of the British Isles remained unsettled for over three hundred years, from the time of Robert The Bruce. It was also a time of great treachery, and the Clans often took the law into their own hands, in order to survive. This led to many bonds being formed, like the one between the Elliots and the Armstrongs, but it also encouraged feuds between many Clans, which saw them stealing sheep and cattle, burning homes, and inflicting great violence on each other. During the seventeenth century many Elliots dispossessed in the Borders, settled as tenant farmers in Ulster, mainly in Fermanagh. They continued with their Border traditions, had large closely-knit family groups, with very strong and intense Clan loyalties, and ongoing feuds. Today the Elliots along with the Armstrongs and the Johnstons, all origionally from the Borders, comprise three of the most common names in Fermanagh. The Elliots also emigrated in great numbers to America, Canada, Australia and other countries across the world, and you will find branches of the Clan Elliot active in many of these countries today. The Clan Chief is Margaret Frances Boswell Eliott of Redheugh. 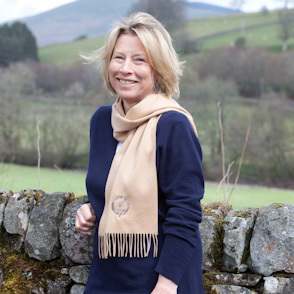 By following the link below you will come to a Scottish company www.vfdesigns.com who supply cashmere and lambswool sweaters and cardigans, with your clan crest embroidered on the chest. 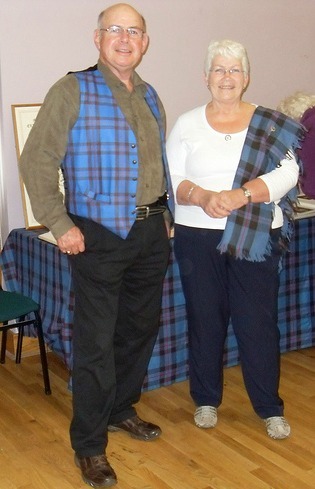 Below you can see a photo of the clan Chief wearing one of their sweaters and scarves, with her clan crest clearly visible. The Elliot Clan has produced some very famous people over the centuries. Some of these include George Elliot, who as Governor of Gibralter conducted the successful defense of the rock against the Franco-Spanish forces in 1779. Gilbert Elliot, First Earl of Minto 1751-1814, Governor-General of India. Gilbert Elliot, Fourth Earl of Minto, Governor-General of Canada 1892-1904, and also Viceroy of India 1905-1910. Pierre Elliott Trudeau 1919-2000, fifteenth Prime Minister of Canada, whose mother was an Elliott. So as you can see, they went from being one of the most troublesome and feared Scottish Border Clans, to producing some of the most famous and successful statesmen the world has seen. The Clan continues to go from strength to strength, and regular Clan gatherings are organized every four years, to promote contact and kinship between Clan members. For those of you interested, their next Clan gathering will be held in Redheugh, Roxburgshire, Scotland. It will take place in August 2013, the date is to be confirmed toward the end of December 2011. If you would like any further information on this or any other Scottish or Irish Clan, then drop me a line using the contact us page, and I will be delighted to help.